Barry Stephens Lyons was born June 3, 1960 in Biloxi, Mississippi. The six foot one, southern man was an All American catcher at Delta State, University. He was originally drafted by the Detroit Tigers in 1981, but did not sign. The next year Lyons was drafted by the New York Mets in the 15th round & this time he did sign. In 1984 with the A ball Lynchburg Mets, Lyons batted .316 with 12 HRs & 87 RBIs winning the Carolina league MVP. His MLB career was set back in 1985 when the Mets acquired All Star, Gary Carter. Lyons near future was to be the Hall of Famer Carter’s back up catcher. That season Lyons continued to hit well at AA Jackson, driving in 108 runs batting .307 with 11 HRs. The Mets minor league teams he played for all won championships at all three minor league levels. Lyons started out on the Mets squad in April 1986, getting his MLB debut on April19th at catcher, as Gary Carter was inserted in the left field spot. Lyons went 0-3 but drove in a run with a sac fly in the Mets 3-2 win over the Philadelphia Phillies. But after going hitless in nine games, he was sent down to AAA Tidewater, losing his backup job to Ed Hearn. 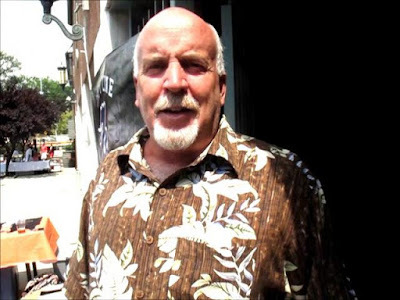 Originally after the Mets had won the 1986 World Series; Lyons, Terry Leach, Dave Magadan and Randy Myers were not set to get World Series rings. But Randy Myers campaigned to have rings made for them all, with the Mets permission it happened. Just before the 1987 season began, Lyons got a chance to play when Ed Hearn was traded to the Kansas City Royals for pitcher David Cone. Lyons officially now became Gary Carters back up for the next two seasons until Mackey Sasser arrived on the scene. On April 26th, he hit his first career HR a pinch hit shot in a 7-4 Mets loss. Lyons had a three hit game against the Pittsburgh Pirates onon June 7th in the second game of a double header. In July he had a five game hit streak, while driving in three runs. 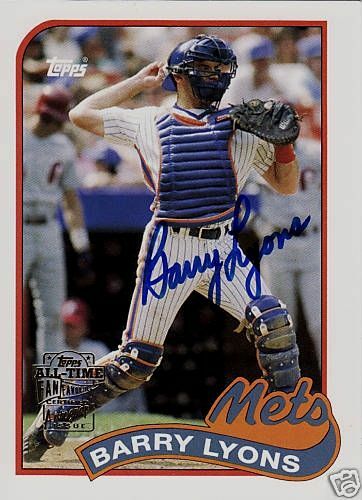 On July 22nd, he helped spark a Mets come back win against the Pirates, when he singled to tie up the game & then later scored the winning run on a Lee Mazzilli pinch hit single. 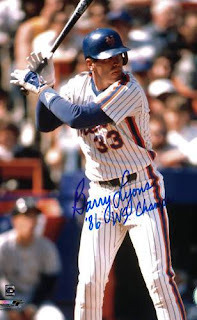 On August 20, 1987, Lyons had one of his biggest moments as he hit a game winning grand slam, off the San Francisco Giants Kelly Downs at Shea Stadium. "We were 2 1/2 games out after that game," Lyons said. "I felt I helped the team." Overall in 1987 he played in 53 games, batting .254 with 4 HRs 4 doubles & 24 RBIs. Behind the plate he threw out 22% of would be base stealers while posting a .984 fielding % in 49 games. The next year he played in 50 games (32 at catcher) batting .231 sharing back up duties with Mackey Sasser. 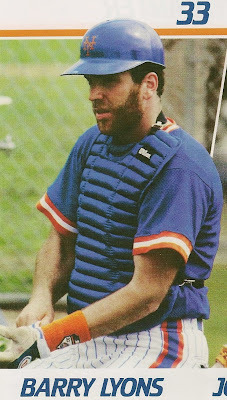 In 1989, Gary Carter missed ten weeks of action, giving Lyons a chance to start. Unfortunately he injured his foot and missed most of the month of July himself. In May he hit HRs in back to back games & got his average up over the .320 mark for a brief time. On June 7th he had a pair of hits with three RBIs at Wrigley Field in a 10-5 Mets win. Upon returning from his injury, he drove in five runs over his first seven games back. In September another hot streak had him drive in five runs over a four game stretch. That season he put up career highs in RBIs (27) games played (79) & at bats (235) but only hit .247. Behind the plate he threw out a career best 27% of base stealers & posted a .980 fielding percentage. By 1990 Carter was at the end of his career & got released. This led to Lyons and Sasser battling for the vacant catcher’s job. Lyons was the opening day catcher & hit a HR in the Mets 12-3 loss to the Pittsburgh Pirates. He was better defensively, but he hit only .238 and was sent back to AAA Tidewater where he hit only .171. He was released in early September, and got picked up by the Los Angeles Dodgers. He spent the next three seasons in the minors, and then had one last hurrah with the Chicago White Sox in 1995. That year he had career highs in average (.266) & HRs (5) playing in just 27 games. He also had a six-game hitting streak and a four RBI game with the Sox. At the end of the season he retired at age 35. In his seven year career Lyons batted .239 with 150 hits 26 doubles 5 HRs 16 RBIs & a .304 on base %. At catcher he threw out 23% of would be base stealers with a .981 fielding % in 207 games. Retirement: After baseball he became a minor league manager, a broadcaster and ran a baseball academy. In 2002, Lyons was involved in bringing pro baseball back to his hometown of Biloxi becoming the GM for the amateur Biloxi Breeze. 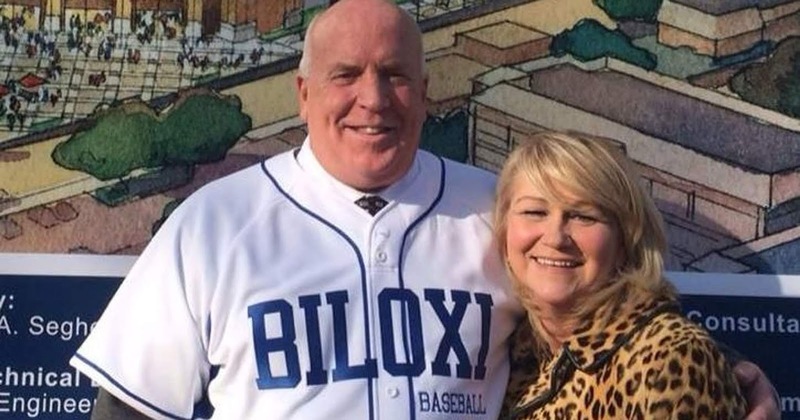 In 2014 he brought pro baseball back home, with the AA Biloxi Shuckers, an affiliate of the Milwaukee Brewers. Drama: During Hurrican Katrina his home was destroyed &he lost all his possessions, including his 1986 World Series ring. Luckily his family all managed to survive as they rode out the storm.